Approx. 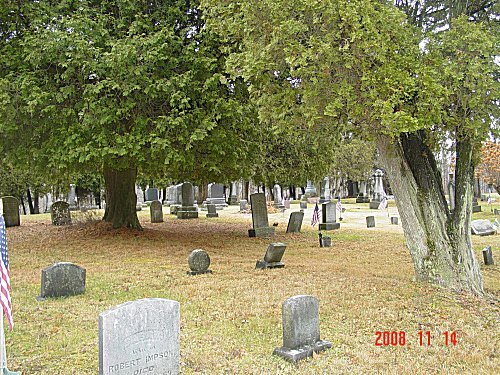 1600 Burials in this listing. Wetherbee William K. 1922 On marker w/Arline P.
Wetherbee Madeline M. 1920 1993 On marker w/Allen J.
Roby Ausburn B. 12/31/1894 6/9/1988 On marker w/Ann D.
Wilson Neal K. 1934 1941 On marker w/Richard G.
Wilson Walter E. 3/25/1940 Infant s/o H.E. & F. B.
Wilson Flossie B. 1900 1996 On marker w/Hugh E.
Dickinson Donovan R. 4/9/1933 4/9/1999 On marker w/Donna J.
Olmstead Emma W. 1888 1984 On marker w/Lynn H.
Dibble Dorotha J. 3/22/1922 On marker w/George R.
Dibble Flora Mae 1898 1945 On marker w/George A.
Torpy Wm. Merl 1884 1957 On marker w/Mary E.
Torpy Sophia T. 3/12/1928 On marker w/Quentin W.
Faulkner George E. 1876 1958 On marker w/Maude A.
Heath Harry B. 1925 1985 On marker w/Irma R.
Heath Harold T. 1893 1980 On marker w/Irma R.
Heath Charlotte E. 1892 1987 On marker w/Irma R.
Townsend Donald W. 1920 1999 On marker w/Frances L.
Bowers Freda J. 11/19/1923 1/31/2008 On marker w/Henry J.
Robertson Leon A. 1879 1958 On marker w/Mattie A.
Robertson Blanche L. 1911 On marker w/Harold G.
Starkweather Karen L. 1967 On marker w/James O.
Starkweather Dewaine D. 1955 On marker w/James O.
Starkweather Leda B. 1932 On marker w/James O.
Starkweather Paul D. 1/16/1929 8/6/2006 Cpl. US Army Korea-On marker w/James O.
Starkweather Fred E., Sr. 1/30/1900 2/2/1965 On marker w/Florence M.
Starkweather Wilbur C. 4/19/1924 9/9/1993 On marker w/Martha P.
Parsons Nina M. 1886 1976 On marker w/Frank E.
Copley Nellie L. Parson 2/12/1914 On marker w/Wayne C.
Root Mary R. 1899 1986 On marker w/Vada L.